House fires are one of the scariest possibilities every homeowner must face. Along with the danger of the fire itself, however, the fire damage restoration process can be dangerous as well. Understanding the real facts about fire damage restoration will keep you safer and lead to your home being restored sooner. Below are four common misconceptions about fire damage restoration. Understanding these will help you avoid making the same mistakes that many other homeowners make. For any fire restoration needs or questions, however, don’t hesitate to contact the pros at JNT Restoration in the Escondido, California area. Soot damage is most definitely NOT easy to clean up. Soot is essentially microscopic particles consisting of carbon made by the incomplete burning of organic matter. Because it is so small, it can disperse itself everywhere. Thus, cleaning it up can be a nightmare. For certainty and peace of mind that the soot has been properly cleaned, you will want to call on a certified restoration company to handle this for you. to steal any remaining possessions in your home. It also stops the effects of weather from damaging the inside of your home. Last of all, keeping your home boarded up will prevent unwanted invasions from birds, squirrels, and other wildlife. Boarding up your home may be a little more work up front, but it is definitely worth the effort in the long run as it protects your possessions and the state of your home. only warn you of a fire but help put it out and mitigate the danger. 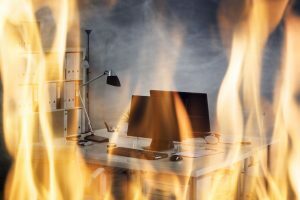 Now that you know these common fire damage restoration mistakes, you can avoid making them as so many others have before. Avoiding these mistakes will keep you safer and prevent disruptions in the restoration process. Most importantly, however, JNT Restoration in the Escondido area has the quality and resources necessary to restore your home back to top shape after a fire. We will handle the dangerous work for you and get you back to your home as soon as possible.